Interactive animation demonstrating the relationships between the various systems of an internal combustion engine with ignition to the fuel injection that develops the Diesel cycle and plots in a Pressure x Volume diagram idealized approximations of the curves of the theoretical Diesel cycle, allowing us to study the system more easily. This type of engine uses as fuel: light and heavy fuel oils (derivatives from petroleum which the ambient pressure and temperature are not flammable); Bahia Oil etc. – Keep rolling the page and go to a summary table to understand the aspects of the Diesel cycle, fuel injection / auto-ignition. 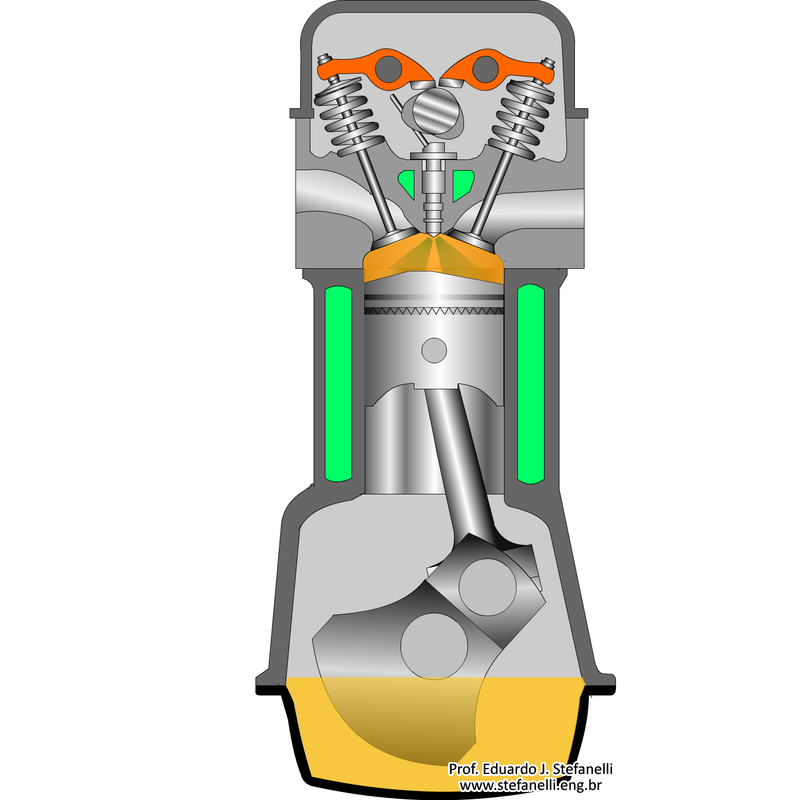 With piston at PMS – dead upper point point – the valve control opens the intake valve, the inertia of the crankshaft moves the piston rod that pulls the piston towards the lower PMI – lower dead point – moving the plunger reduces the pressure in the combustion chamber, upper cylinder and the vacuum created draws air virtually no change in pressure. The cylinder volume is filled with air from the atmosphere – oxygen – filtered, with approximately one atmosphere pressure. (Adiabatic) With the piston in the PMI, the intake valve closes and the crankshaft, which continues to rotate, pushes the piston on the way to the PMS by compressing the air in the combustion chamber without exchanging thermal energy with the environment. In motors operating under the Diesel cycle, the compression ratio is very high, from 15: 1 to 25: 1. Part of the mechanical energy of the piston, and the kinetic energy of the particles, is transferred to the air increasing its thermal energy and its pressure to a point that allows fuel to ignite – which is not flammable at ambient pressure and temperature. Some degrees, of crankshaft rotation, before the piston reaches the PMS, a system injects the fuel – ignition-loss, in the form of aerosol, which volatilizes in the superheated air and in the PMS starts the firing. The process of fuel volatilization requires some time, so the injection takes place at the end of the second half. The fuel ignition takes place by autoignition, its burning is slow and constant and its expansion forces the walls of the combustion chamber constantly, including the piston head, and increases the volume of the upper cylinder to force the piston displacement. The pressure and temperature inside the cylinder don’t change; in an analogy, pushes the piston head to the IMP; forcing the rotation of the crankshaft to provide torque. With the piston stroke, the chemical reactions-which convert into heat energy the power of the connections of the fuel molecules, and the decomposition of the large fuel molecules in the formation of several small molecules of water, carbon dioxide, carbon allotropes etc.- that contributed to the maintenance of pressure begin to reduce and there is a drop in pressure -at increased volume- without exchange of thermal energy inside the cylinder. With the piston approaching the PMI, the exhaust valve begins to open, the gases resulting from the combustion, which are in pressure and temperatures higher than atmospheric, quickly escape to the exhaust manifold and the pressure in the cylinder falls into an atmosphere. The third cycle is the only one that provides mechanical power to the engine cycle. With the piston in the PMI, and the open exhaust valve, piston, moved by the inertia of the crankshaft, resumes his way to the PMS cylinder expelling the gases from the combustion, with virtually no change in pressure. Just before the drum reaches TDC the inlet valve begins to open, the temperature difference and density of the gas admission and exhaust, and the inertia of the gases, drag the remnant of exhaust gases to the exhaust manifold . The exhaust valve closes in preparation for the resumption of the four-stroke.